How about adding more of a good thing? 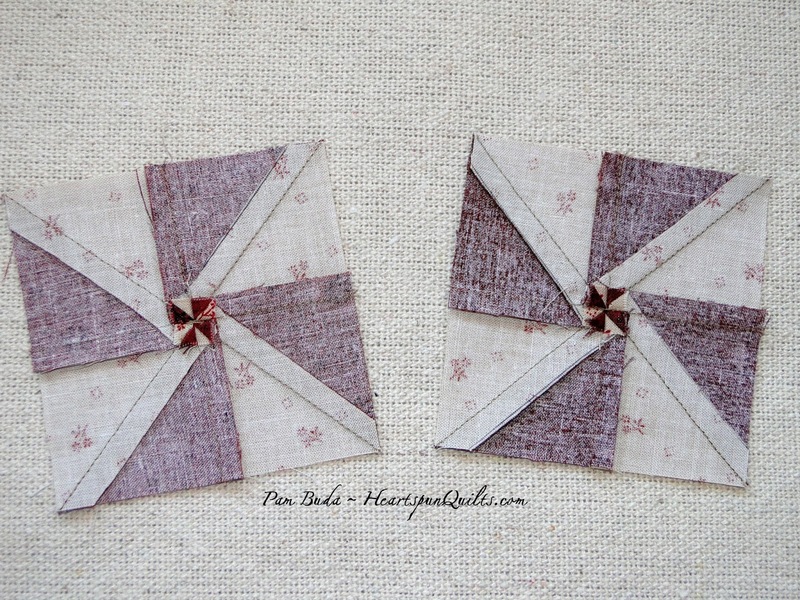 A few more Pinwheels.....Yay! 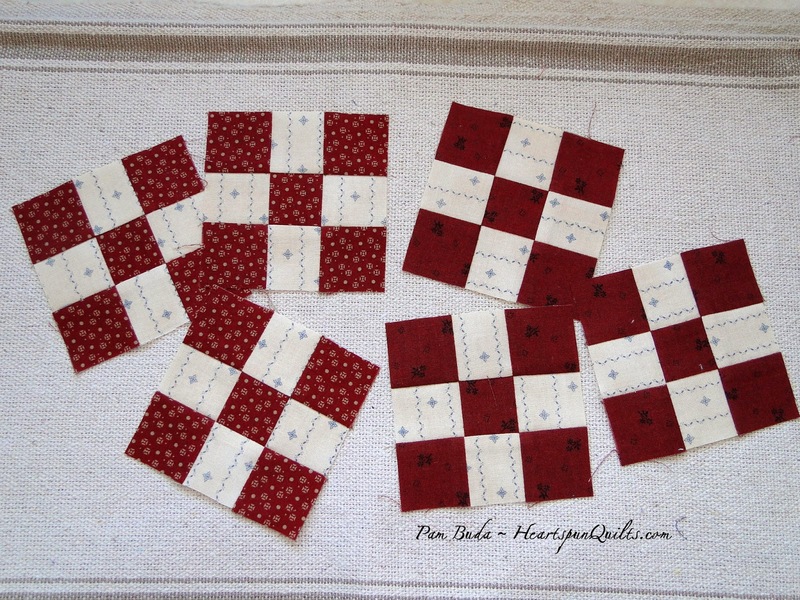 *Cut (8) 2 3/8" ( 1 5/8") squares. 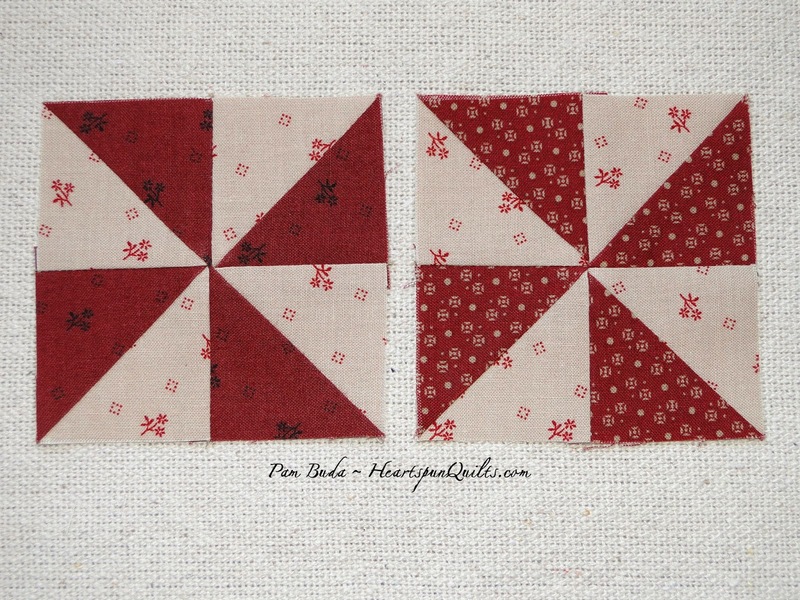 *Cut (4) 2 3/8" ( 1 5/8") squares. Make more Pinwheels following the techniques previously described, using (8) 2 3/8" (1 5/8") light print #4 squares, (4) 2 3/8 (1 5/8") red print #2 squares, and (4) 2 3/8" (1 5/8") red print #3 squares. You will have (2) light print #4 and red print #2 sets, and (2) light print #4 and red print #3 sets. Blocks should measure 3 1/2" (2") unfinished. OMG!!! I can hardly stand it. Next Friday is the big REVEAL!! Do you have any idea of what it will look like?? I hope I'll be surprising you! Wednesday, I traveled to up state New York for a visit to the Patchwork Garden Quilt Shop. 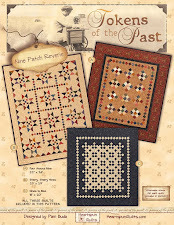 Lynne Hagmeier (of Kansas Troubles Quilters) are there together teaching four sold out classes. I'll post about the shop and the classes when I return home, but I wanted to take this opportunity to remind you that we have a great workshop coming up!! There are still a few spots open waiting just for you. Consider traveling with your friends for a memorable week of great sewing projects, good food, laughter, and loads of fun. Introducing ~ A Prairie Gathering! I'd like to introduce you to a very special project called A Prairie Gathering! This quilt, and the fabric collection by the same name, is what I've been working on for just about a year now. The folks at Marcus Fabrics asked me to do a Block of the Month for them, and to tell ya the truth, I was very, very flattered, and more than a bit intimidated. With lots of encouragement from everyone there, and lots of help from my fellow designers, too, I let my creativity guide me and designed what is really a NON-BOM program. Leave it to me to be a pioneer (prairie?) woman and forge a different path. 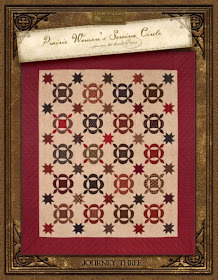 As you can see, A Prairie Gathering is a two color, Medallion style quilt. 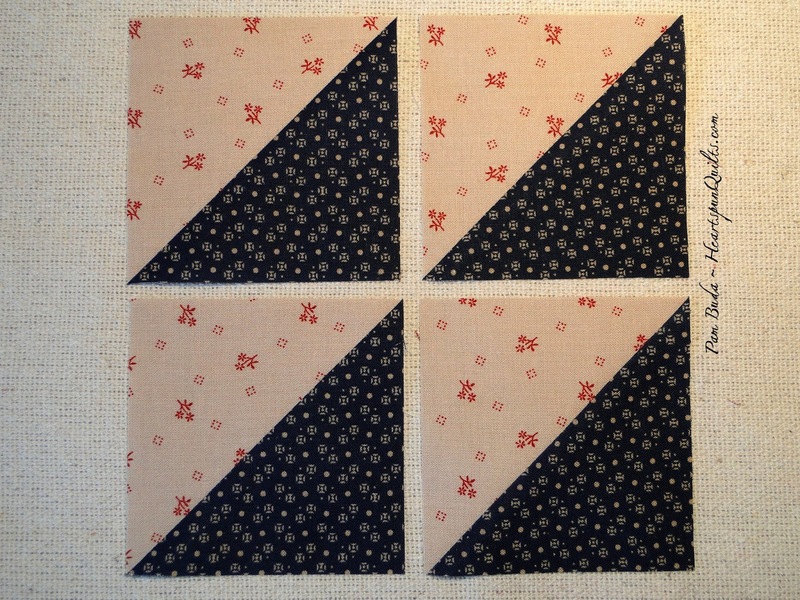 There are blocks in the quilt, of course, but it really isn't a traditional block-of-the-month. During the year long program, you will be making parts of the quilt from the center out. By the third month, the entire center medallion is complete. In a few more months, the Flying Geese border, and Checkerboard border are complete, with each subsequent border being completed as you go through the months. The moment I returned from Spring Quilt Market, my friend Deb & I began making the quilt (which is still why I haven't posted photos from market!) It was so fun to see the quilt come together, and I had a great sense of accomplishment when each new border was complete and sewn to the quilt. The other great thing about this quilt that you won't have a big finishing project to do at the end. It's already done! I took photos the whole time we were making the quilt. I plan on blogging all about how the quilt is made when the program begins in January, so you can follow along with my blog posts while you're making the quilt at home! Won't that be so cool?! I thought that was using the power of the internet in a fun way. 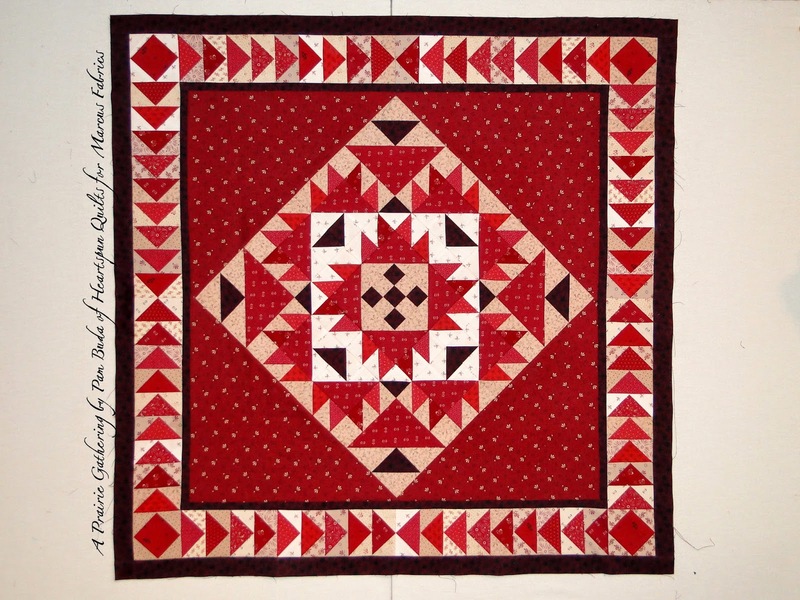 All of the blocks and units in the quilt use modern rotary and piecing techniques....nothing you haven't done before. No teeny, tiny pieces either. Of course I'll give you lots of good instructions and graphics in each pattern. No worries!! The whole program is paced for you to work on various parts of the quilt each month in an organized and comprehensive way. 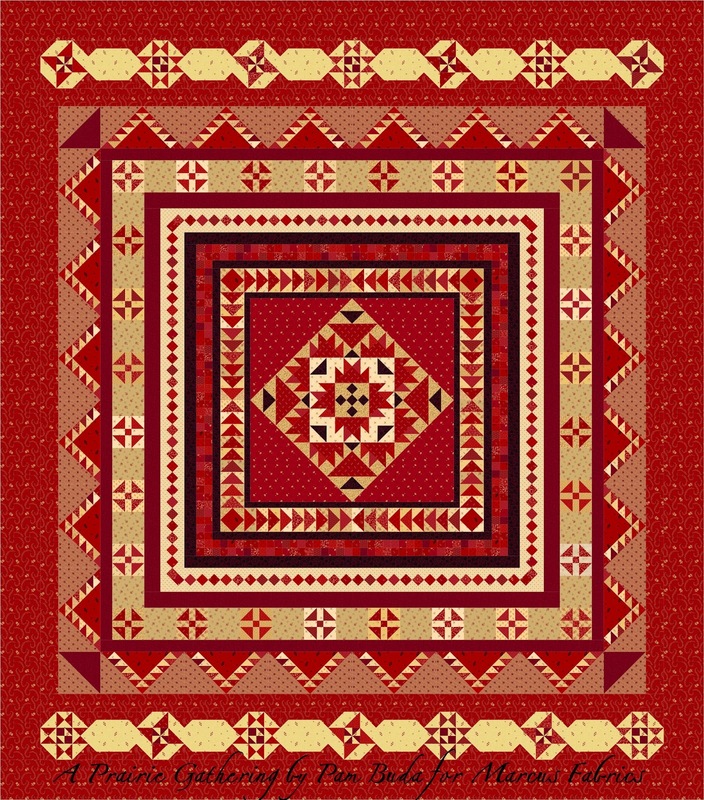 Patterns come quarterly with monthly "chapters".....hence the title "Quilt of the Quarter" in place of Block-of-the-month. 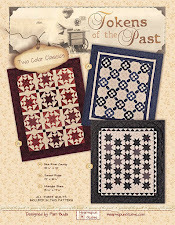 The medallion style quilt is one of my favorites....old, traditional and classic. 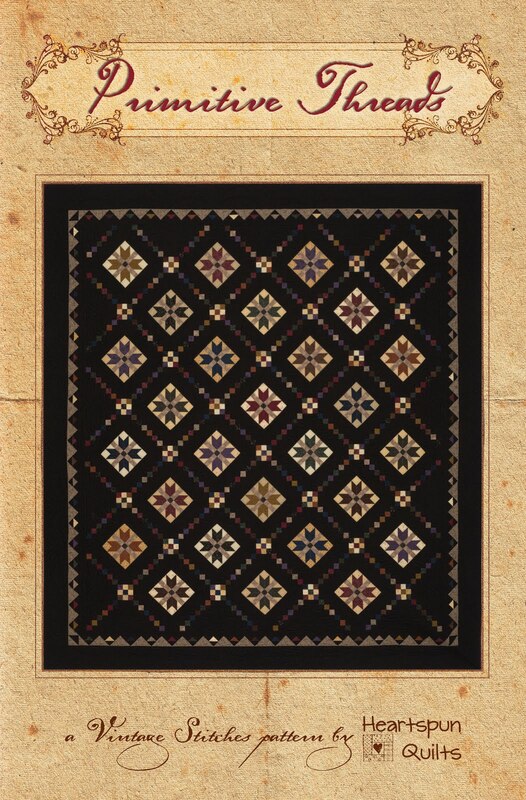 Among the earliest quilt styles, after the Mosaic, and before the block style we know and love, Medallions lent themselves well to the many causes of the nineteenth century. You know how I love to read and research about life in early America, c.1840. I have done so for A Prairie Gathering as well. 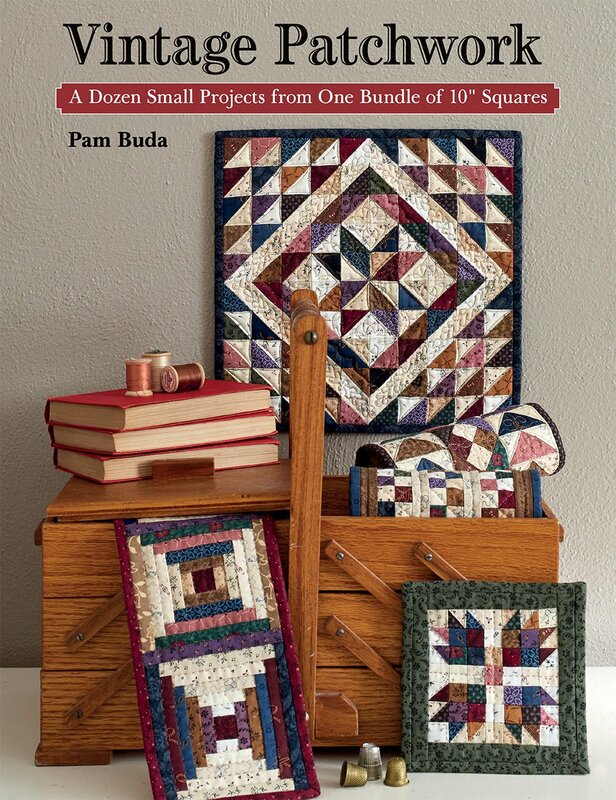 In each quarter pattern, I've included short, historical stories about The Sanitary Commission, The Soldier's Aid Society, The Temperance movement, and signature block quilts, all of which used quilts as fundraisers for causes. 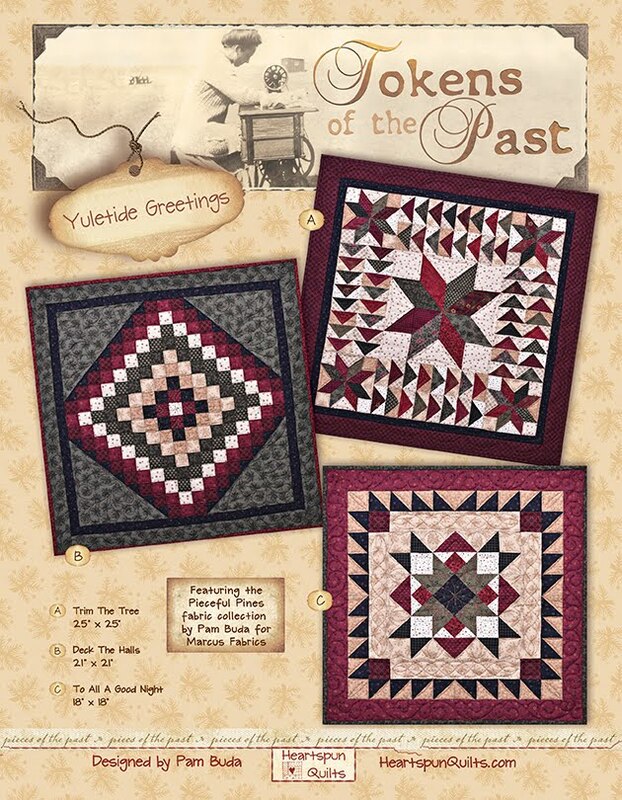 As you piece your quilt, you'll "Journey the threads of time" TM creating a family heirloom just as your quilting ancestors did! About the fabrics......oh! The fabrics!! If you're a regular reader of my blog, you know red is my favorite color!! 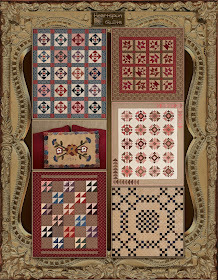 The reds in the EQ photo of the entire quilt pictured above are much lighter and brighter than the real fabrics are. My favorite red is more of a cranberry red, and as Marcus always does, the colors and prints are divine!!! A lot of work and effort went into producing just the perfect shades of reds, and the prints are adorable...if I do say so (humbly!) myself. 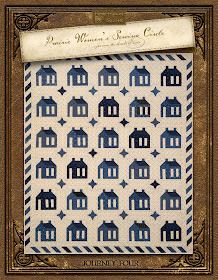 A Prairie Gathering is making its debut July 1st on the Marcus Fabrics website. You'll be able to see all of the fabrics in the collection then. Shop owners will be able to see the fabrics, and get all of the program details beginning July 1st, both on the Marcus website, and from their sales reps.
What that means for you is A Prairie Gathering will begin showing up in your local quilt shop as early as November for sign-ups, with the program likely starting in January, 2015. I sincerely hope you like what you see!! Would love to read your comments and opinions.....no matter what they are!! 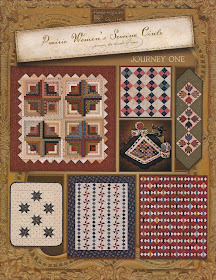 I'm leaving in the morning headed to up-state New York to teach at Patchwork Garden Quilt Shop. Leave me a comment and I'll have a give-away for one lucky winner! I sure hope you've enjoyed the sew-along thus far. We're nearing the end. Not too many more blocks to make....I'm getting anxious to show you the quilt! Are you getting anxious, too? 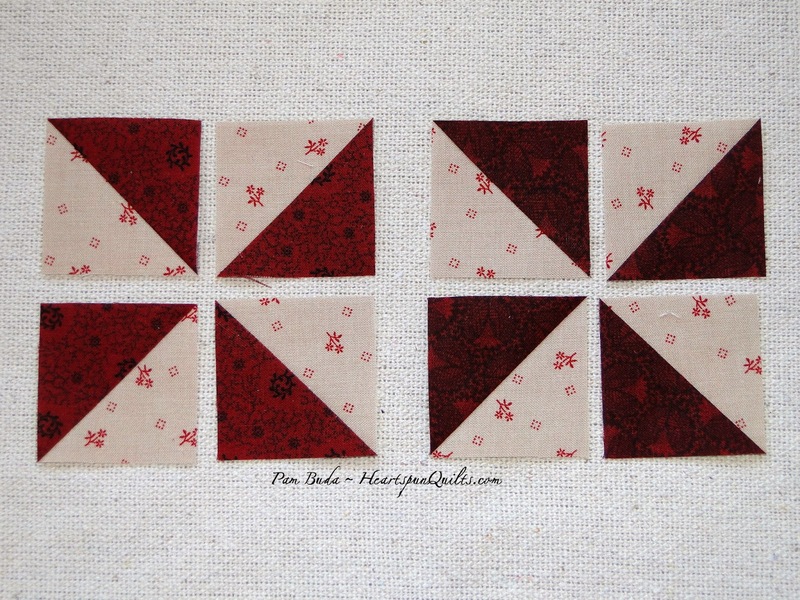 In the same manner as you did before, construct (3) Nine Patch blocks using light print #3 and red print #4, and (3) Nine Patch blocks using light print #3 and red print #5. 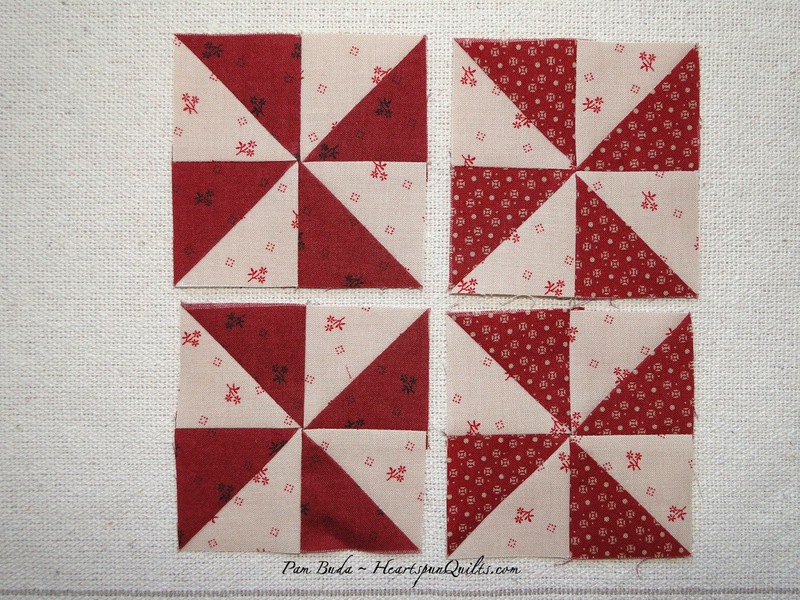 Your Nine Patch blocks should measure 3 1/2" (2") unfinished. 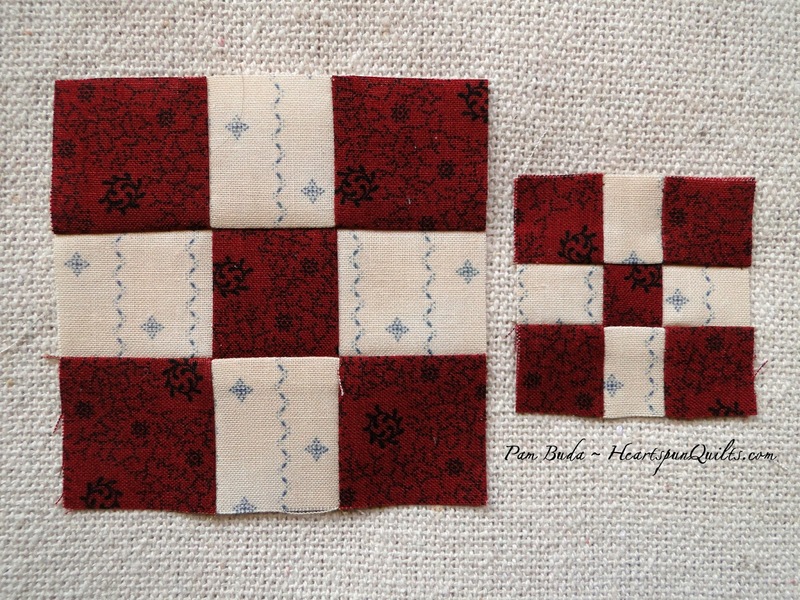 You should have (12) Nine Patch blocks altogether: three each of the four different prints. Looking good! Looking so good! That's all for today.....let's make a date to do this again next Friday. P.S. Apparently I don't know how to count, or lost my mind (better chance it was that! ), or wasn't thinking....whatever the cause for my "some-timers", we actually have 2 more weeks to go. Next week will be another sewing part with blocks and the week after will be the Big Reveal. Geesh.....I think I need a vacation! Marcus Fabrics Designer Sew~Along Coming Soon! 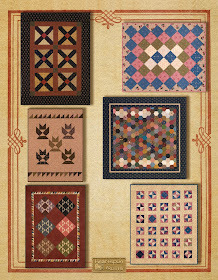 We've assembled just some of the talented Marcus designers, both in the New York office, and scattered around the country, to offer you an opportunity to make a truly unique quilt featuring nine original blocks designed just for this event. For ten consecutive Fridays, starting August 1st, you'll get to see the blocks, and receive block instructions from each designer by visiting their blog. Oh, and there will be prizes, too!! No doubt some of our gorgeous Marcus fabrics will be given as prizes. Perhaps a surprise or two as well! 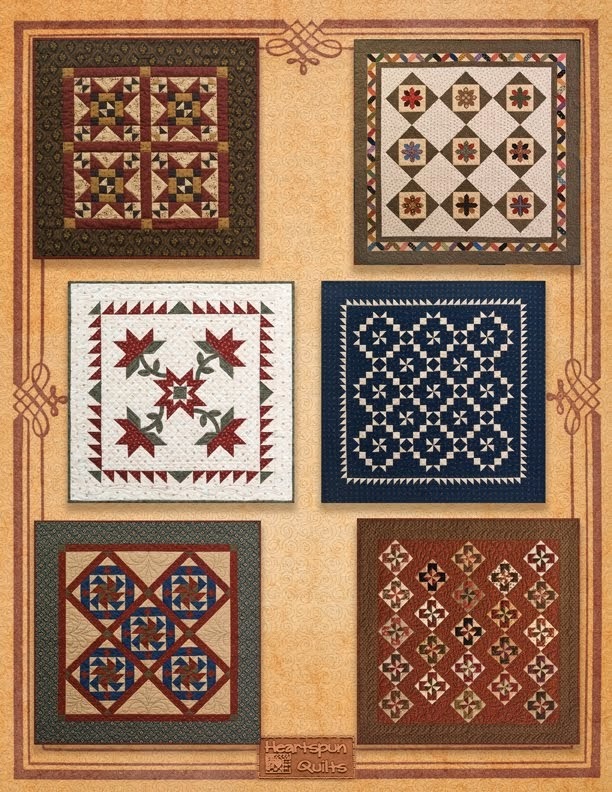 Our quilt features selected prints from Paula Barnes' Companions collection. I will have a limited number of kits available until July 7th or until they're all gone, so don't delay!! 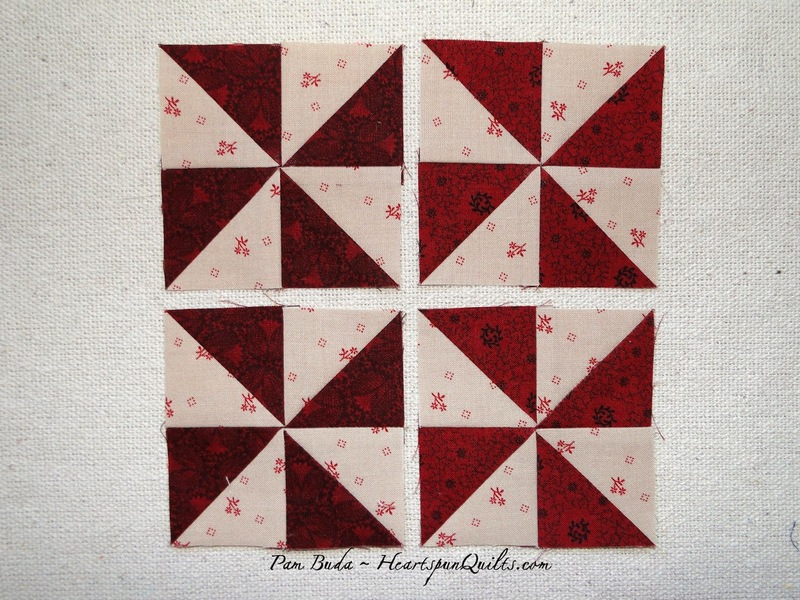 If you'd like to order a kit for the quilt top and binding click here. Here is the designer and blog schedule for our Friends & Companions sew-along. Be sure to save the dates and please pass this news along to all your friends! 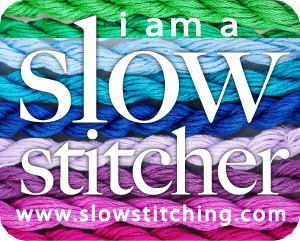 In preparation for our sew-along and to be sure you don't miss a thing, I highly recommend visiting each blog now, and enter your email address in the "Follow by Email" icon. That way you'll receive each blog post via email, which you can then print and take to your cutting board and sewing machine. Oohhh...I'm so excited to begin! P.S. To "Follow by Email", you will receive an email from each designer to verify your blog subscription. You must click the link given in the email to complete the process. Easy, breezy! Do you have a busy week? Most of us have pretty busy weeks all the time, so you'll be happy that we have a couple of easy blocks. Super quick and you'll be on your way. Make Half Square Triangles in the same manner as before by drawing a diagonal line on the wrong side of the (2) light print #4 squares. 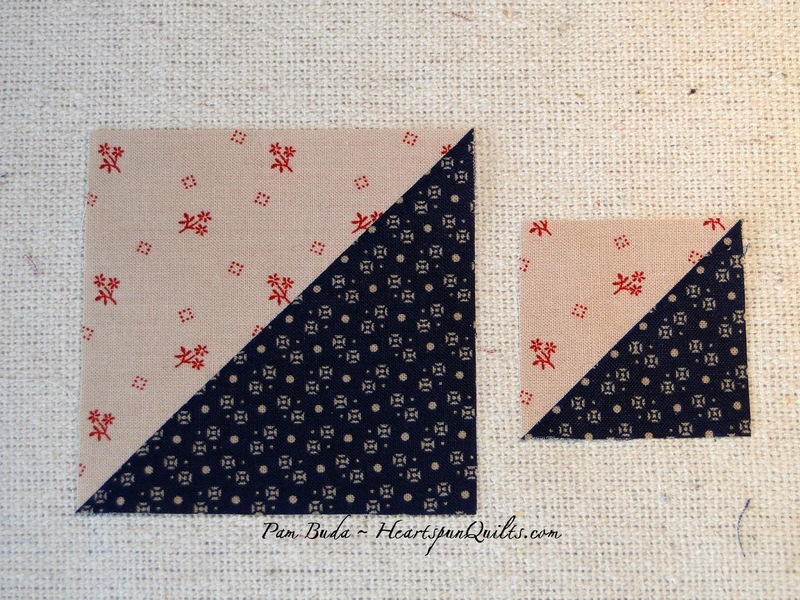 Pair with a blue square and sew 1/4" on each side of the drawn line. Cut apart and press to the blue triangle. Love these easy blocks. But....don't think the quilt has no pizzazz! I wouldn't do that to you! I have missed you! To say I've been busy since before Market is a mammoth understatement. We're always busy, right? No chance we'll be bored, but sometimes busy is crazy! I'm usually a busy person, and I kinda like it that way, but this is quite unusual. 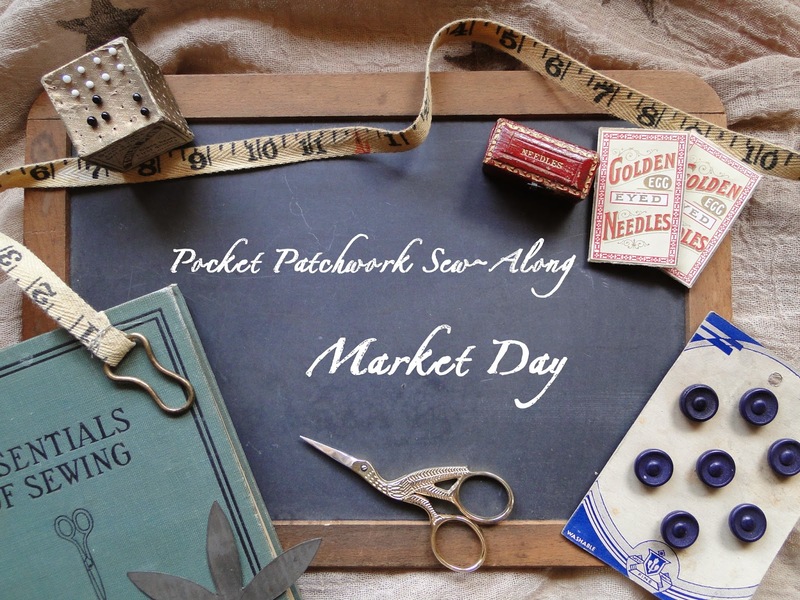 So much so, I didn't dare take the time to blog other than for our Market Day sew-along posts. Well, I've come up for some fresh air and to take a moment to share what's been happening. Since returning from Pittsburgh and Spring Market, (I still owe you a blog post about market before it's all old news!! ), I went immediately to my sewing machine, and that's where I've been ever since, save for one day to travel to Iowa. First of all, I can begin to share what I've been working on for the last 10 months. 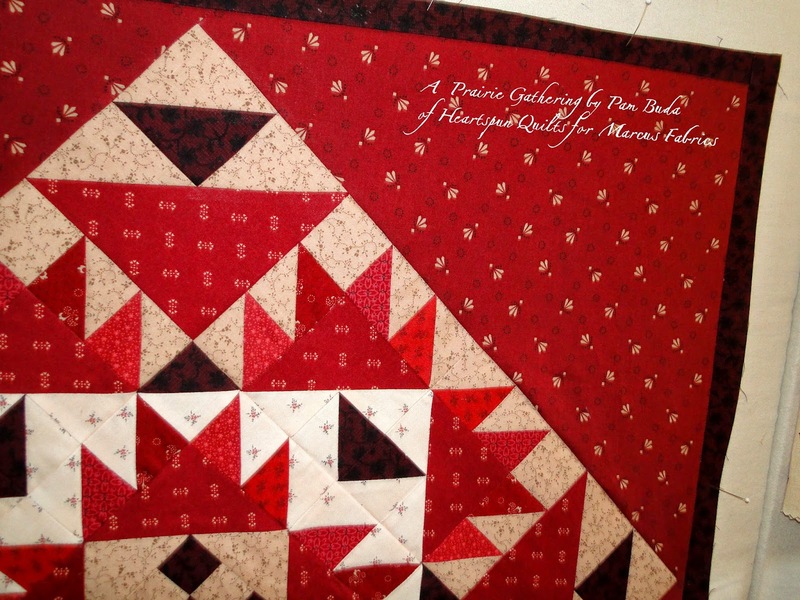 I was asked by the good folks at Marcus Fabrics to create a Block of the Month program. I was thrilled!!! I was terrified! 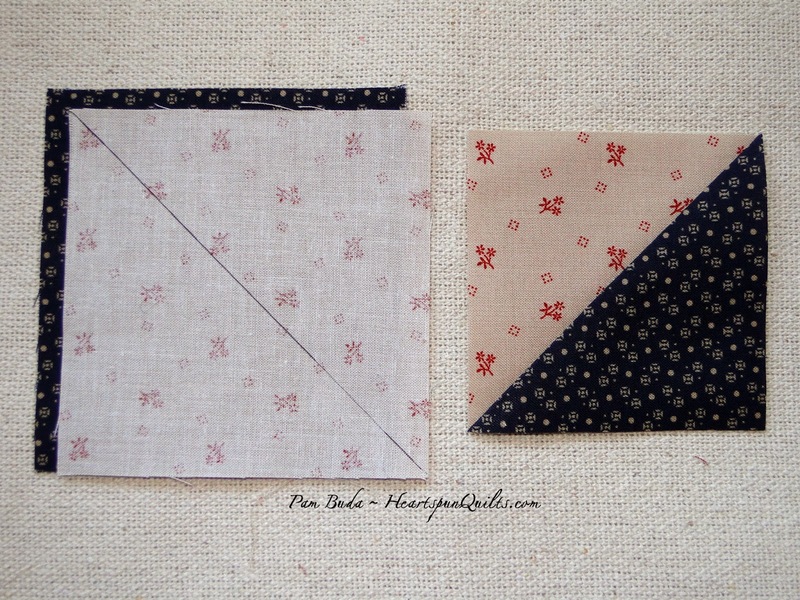 So, I worked on a quilt design and the fabric collection that would go with it. The fabric is all done and my sample yardage arrived just before I left home for Market. Upon my return, with the help of my friend Deb, we've been constructing the quilt and I've been writing the pattern. Sewing, testing, proofing, cutting, and toasting two irons in the process. Yup.....one was brand new that was faulty, overheated and burned a piece of fabric, and the other one was old and tired and just gave out. I'm sewing the final pieces now and off to the quilter it goes. I'm deliriously happy with the way it's turned out and can't wait to share everything with you. 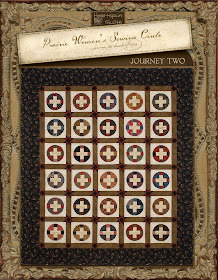 I'll be sharing everything about the program the first week of July with a photo of the quilt design. Can't wait!! Last Saturday, I dusted the threads off of my shirt and traveled to Inspirations Quilt Shop in Hills, Iowa. I had visited this shop before and couldn't wait to return!! Shop owner Nancy Lackender and her staff of talented shop girls do an awesome job living up to the inspirational shop name. 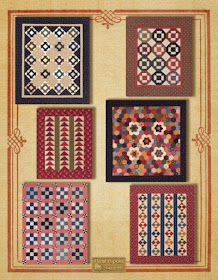 The shop is loaded with lovely quilt patterns, kits, and as you can see, a yummy collection of fabrics. I went there because Nancy is beginning my Prairie Women's Sewing Circle club and she asked me to come to give a trunk show showing all of the five Journey quilts. The quilts on the wall belong to a shop customer. Nancy routinely displays the work of a different shop customer each month, which I think is a great idea! 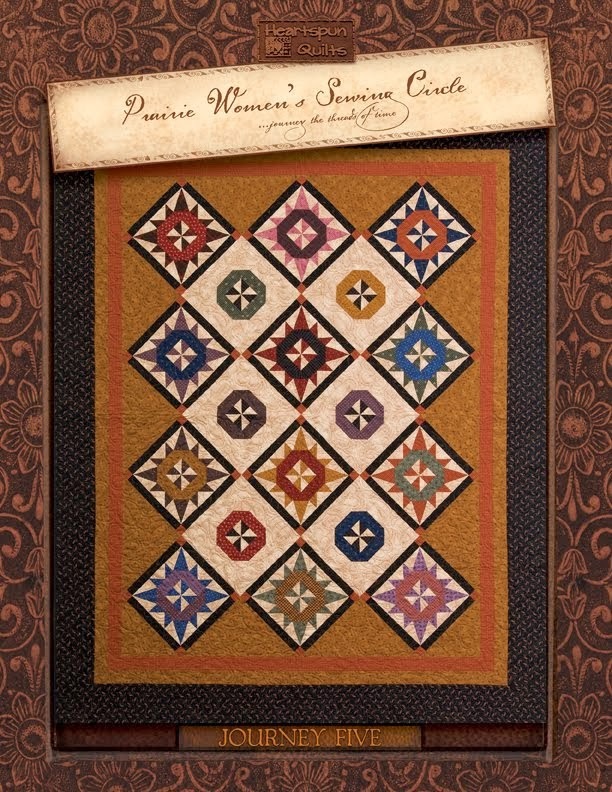 Visit the Inspirations Quilt Shop and join the Prairie Women's Sewing Circle club! They already have a lot of wonderful ladies signed up and will be a lot of fun! Guess what? There's another sew-along coming your way very soon!! This time, it won't be just me. I'll be joined by eight very creative and talented friends! 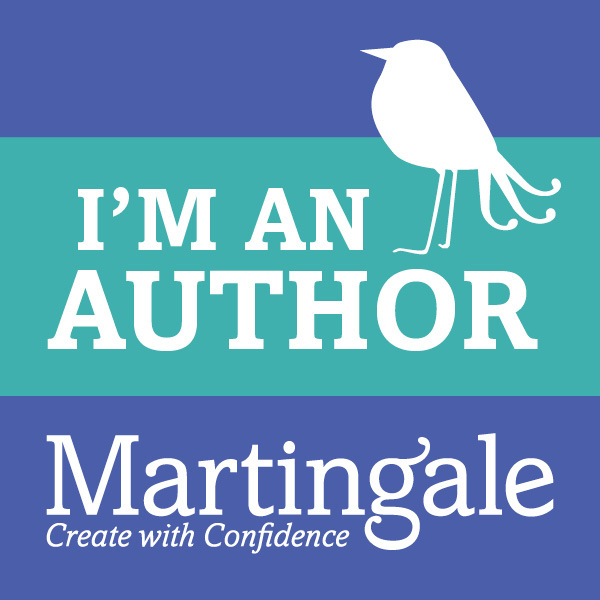 Look for news all about this on Monday, June 16th right here on my blog. You can also see sneak peaks of A Prairie Gathering fabrics and on my sewing progress on my Facebook and Instagram pages!! I'm about to add a different block into our repertoire. One of my favorites....a Pinwheel. 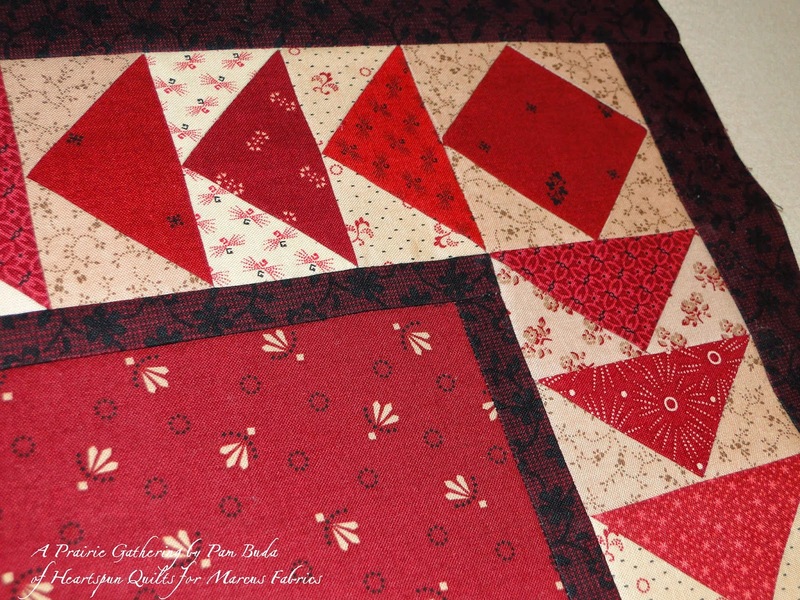 It always gives such a happy feeling to a quilt, not to mention some fun motion! 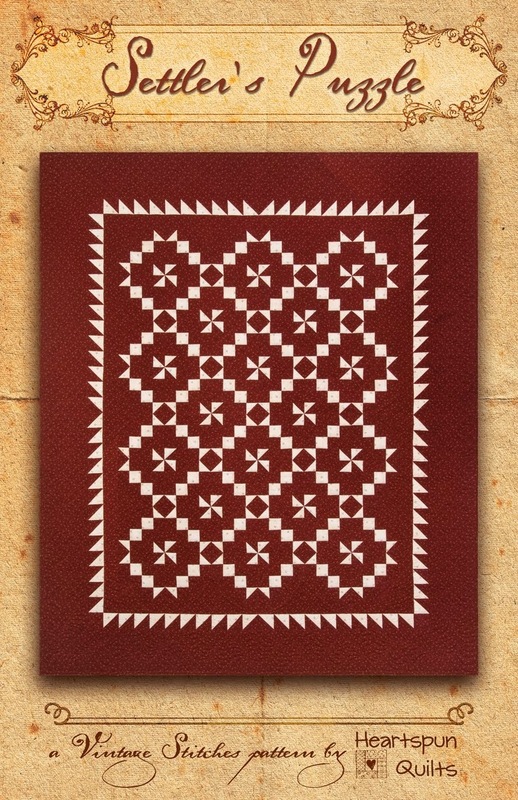 Make Half Square Triangles in the same manner as previously described by drawing a diagonal line on the wrong side of all (8) light print #4 squares. 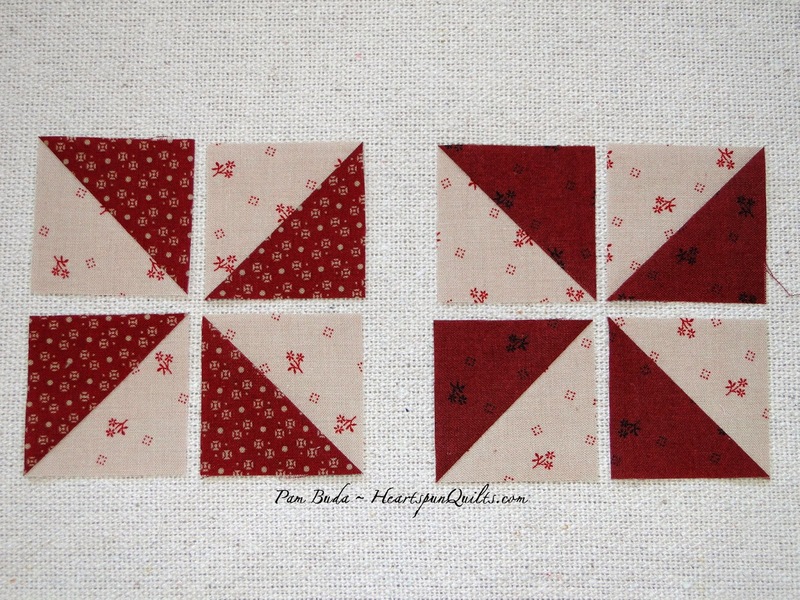 Match each with a red square and sew 1/4" on both sides of the drawn line. Cut apart and press to the red print. Make (16) Half Square Triangles measuring 2" (1 1/4") unfinished. Arrange them into Pinwheel formations. 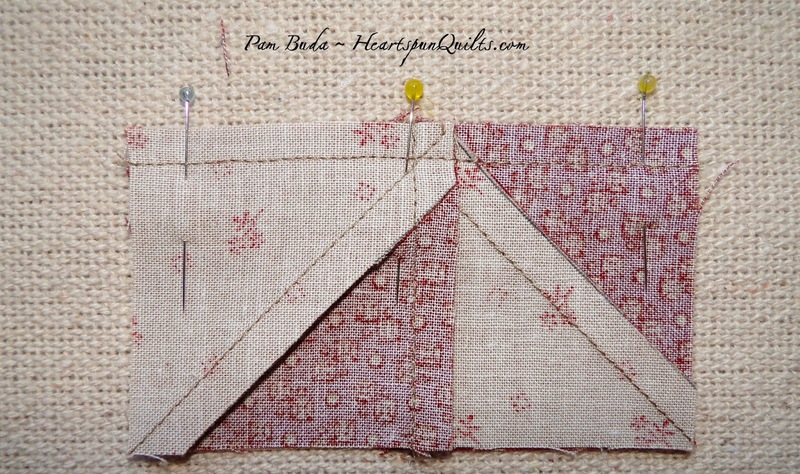 Sew the rows together.....make sure to press for opposing seams. 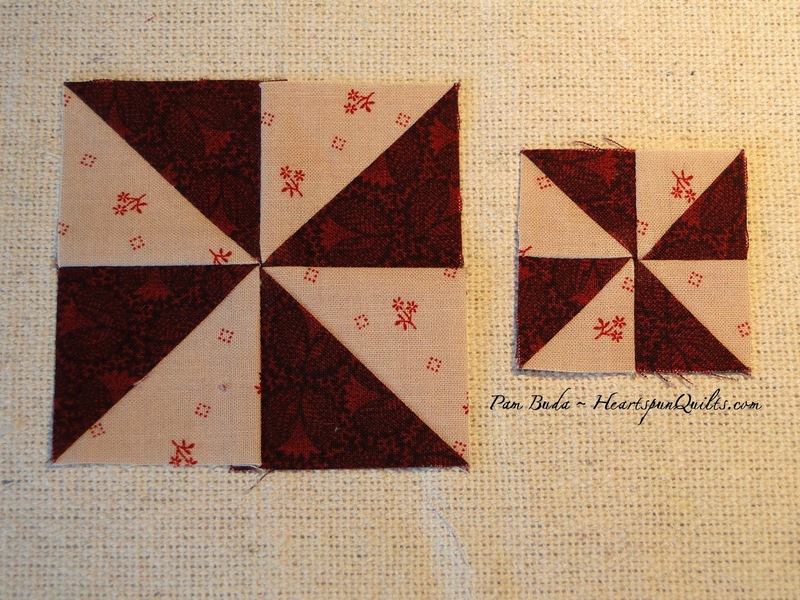 Next, sew the two Pinwheel rows together to complete the Pinwheel block. Snuggle those opposing seams and pin, pin, pin! ....then "Four Patch" press them to reduce the bulk!! Very, very helpful and really aids with accuracy, too!! Make (4) blocks measuring 3 1/2" (2") unfinished. Don't know how to do the "Four Patch Press"? 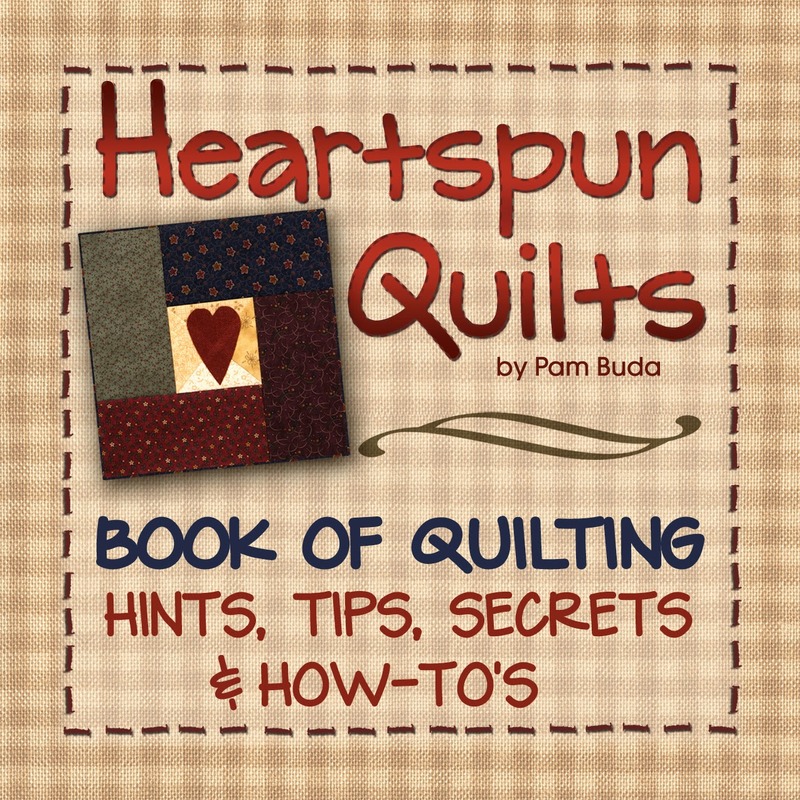 That technique and tons more good piecing hints (and sooo much more) are all found in my Heartspun Quilts Book of Hints, Tip, and Secrets!! Great job, everyone!! More blocks coming next Friday.